If laughter is the best medicine, music is a close second. In fact, it's number one on my personal list of most effective antidote for depression, stress and illness. Music lifts our spirits and puts a smile on our face. It makes us want to snap our fingers and move our feet. Or just close our eyes and relax. These senior buskers deserve a listen. You can catch them in Bukit Bintang near Starhill, KL. Music stirs up beautiful memories of our life experiences, our first dance, our coming of age years listening to Top of the Pops and Hit Parade. No celebration is complete without music. Best of all, anyone can enjoy music regardless of age. There is such a broad spectrum of music genres we can always find something that appeals to us. My 10-week old grandson falls asleep to soothing baby tunes, and my 87-year old mom, who has Alzheimer's, gets all excited when she recognizes old songs from the pre-War era. This delightful video above showing the Cowans playing an impromptu duet on the piano at Mayo Clinic went viral when it was first posted on YouTube in 2008. It has garnered almost 10 million views, proof that music resonates with a lot of people, especially when it comes from happy people who enjoy playing music. Well, the couple that makes beautiful music together will stay happy together. 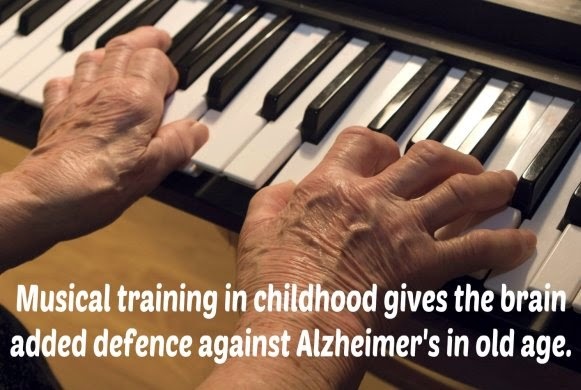 Music can also be a therapy for people with Alzheimer's and dementia. Which brings me to this question - Why are most homes for the elderly so devoid of music? Many of the nursing homes and retirement homes I have visited in Malaysia and Singapore do not give much importance to music as an integral part of their wellness program or incorporate it into their daily activities. 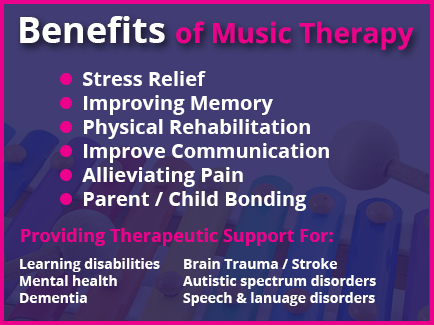 Fortunately, the home where my mom is staying encourages music as a fun activity and as therapy. Members of the Malaysian Philharmonic Orchestra entertains at the Dementia Homecare Centre as part of their Outreach program. My mom at the centre's daily karaoke sessions attempting to sing oldies in English with the aid of her magnifying glass. (Above) Don't let their solemn faces fool you. These senior citizens are members of U3A's (Malaysia) gamelan orchestra. U3A stands for University of the Third Age. They enjoy entertaining the audience and are concentrating on making sure they get every note correct. That's comforting news for me. I am currently taking ukulele lessons so I can sing and play my favorite songs, and maybe shuffle my feet while I am at it. It may take me ages to be a competent ukulele player, but I'll get there one day...and in the meantime, hopefully I am keeping Alzheimer's at bay. 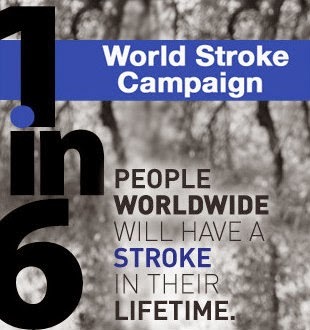 In Malaysia, stroke is the third leading cause of death after heart disease and cancer. 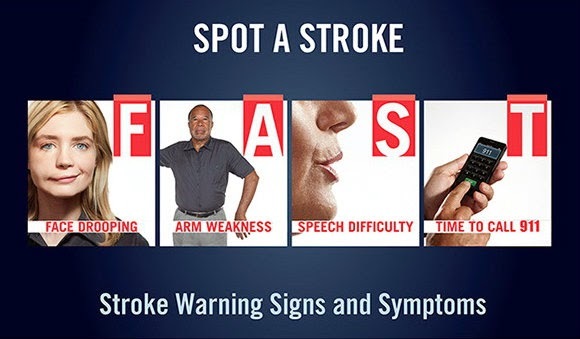 All of us know at least one person who has had a stroke, so these figures are certainly not plucked from thin air. Despite the alarming statistics, there is hope for stroke patients provided they work hard at rehabilitation, and adopt a positive attitude towards recovery. My brother had a very mild stroke a couple of years back. It was more of a warning than a full-blown stroke, and he was lucky to have recovered quickly. I hope he has taken steps to adopt more a healthy lifestyle. Several of my friends who have suffered a stroke are now on the mend and regaining their cognitive and motor functions, including driving. It takes time, but as long as the patient is determined to work towards rehabilitation and recovery with strong support from family members and caregivers, he can look forward to a normal life after a stroke. My friends' successful recovery is proof that life can still go on after a stroke. Ask the person to smile. Does one side of the face droop? Ask the person to raise his arms. Does one arm drift downward? Ask the person to say a simple sentence. Watch for garbled words and slurred speech. Call the medics right away. 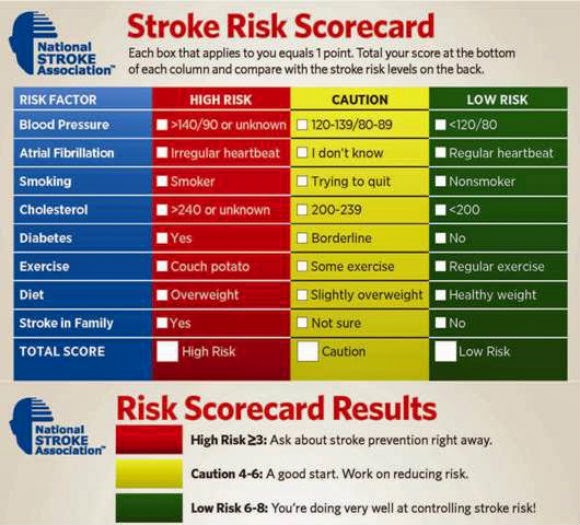 "Time saved is brain saved," says Larry B. Goldstein, MD, of the American Stroke Association. Do not wait and see if the symptoms subside. Call even if symptoms disappear. Note the time when symptoms appeared and let the paramedics know. The National Stroke Association of Malaysia (NASAM) runs a rehabilitation program at its centre in 12, Jalan 7/2, Petaling Jaya. There are branches in other states as well. For more information, call 03-7956 4840, or visit their website. 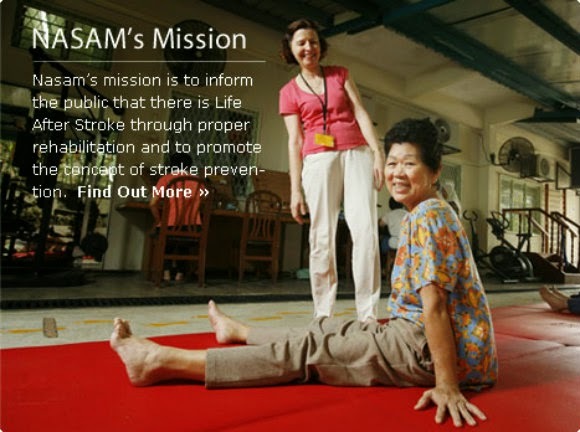 If you live in Singapore, and would like to find out more about stroke prevention and support groups, you can check out the Singapore National Stroke Association. 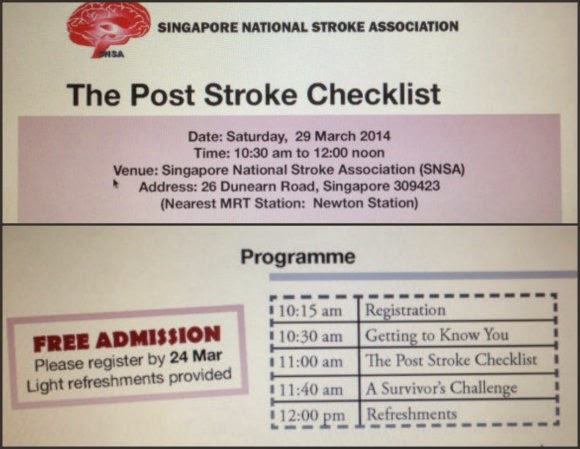 You might want to attend the Stroke Club session on 29 March 2014. The speaker is Dr Christopher Chen. More about him on the website. The article "6 Things You Should Never Call Someone Over 50" published in Huffington Post got me thinking yet again about labels for the over 50. I have yet to find a name for baby boomers that is acceptable to them. It can be a challenge whenever I write about this demographics. 'Baby boomers' needs explanation when used in Malaysia and Singapore. Not everyone knows that the term refers to those born between 1946 to 1964, during the euphoria of the post-WW2 years that led to a baby boom. My mom and I - we turn 87 and 66 this year. She does not mind being called 'elderly'. Our young local media reporters will likely label me 'elderly' too. 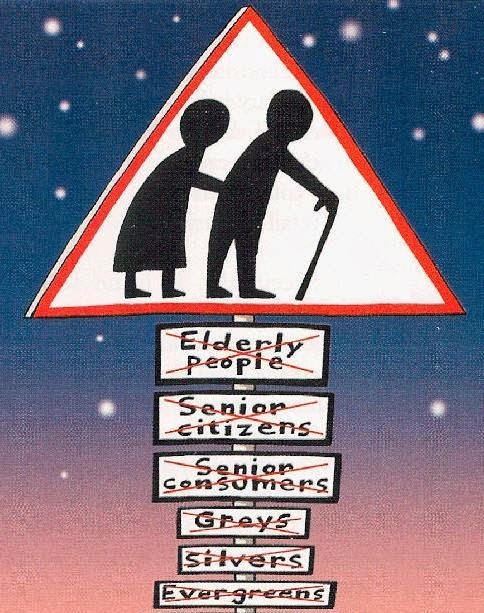 One name that should never be used for us is 'the elderly'. 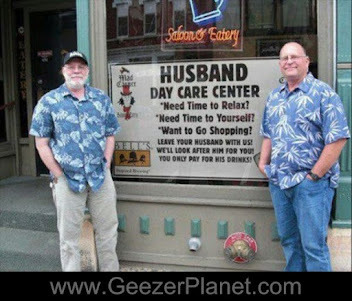 That name should be reserved for those aged 80 and above. It does not help public perception of us when young reporters liberally use the term for anyone who is older than they are! 'Elders' is slightly better than 'elderly' as it denotes wisdom and respectability, as compared to frailty and senility. 'Seniors' is a safer name to use. Even so, I am cautiously hesitant when giving out my SeniorsAloud name card. 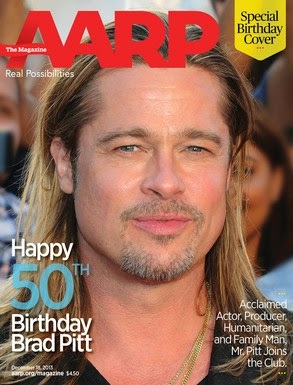 Some people do look older than their age, and grey hair is not always a telltale sign of someone's age. If I am unsure, I'll say "Please share this card with your parents (or grandparents)". 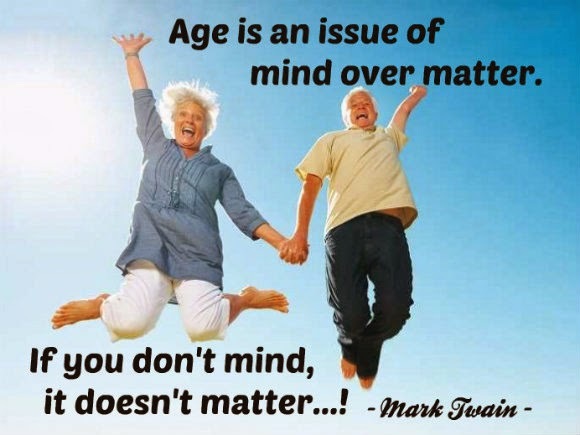 We have all heard the oft-repeated quotes that age is just a number, and that age does not matter unless you are cheese. True, but older women are sensitive to labels that may suggest even the slightest hint that they are ageing. Pretty grandmas all in a row. 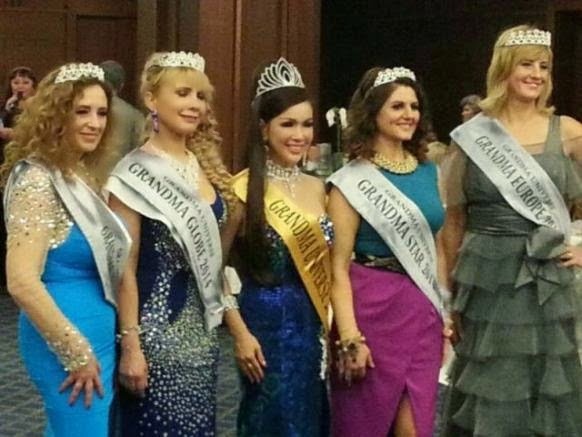 Cynthia Ong of Malaysia (centre) was announced the winner of Grandma Universe 2014 pageant held in Bulgaria on 21st Jan 2014. These ladies would be offended if they were referred to as 'elderly' or even 'seniors'. Admittedly, we all grow older, but growing old has a degree of pessimism attached to it. 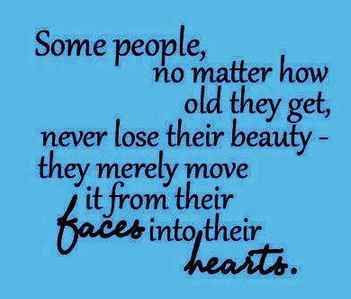 We can't remain young forever, but we can certainly retain our youthfulness. We can be young at heart and young in spirit. Ah, the power of words! They affect how we feel and how we make others feel about themselves. If we keep on saying that we are 'old already' and we can't do this or that, or that we are 'useless' and just 'waiting to expire', we are reinforcing the negative public perception of who we are. It's time we changed that, and change has to start with us. 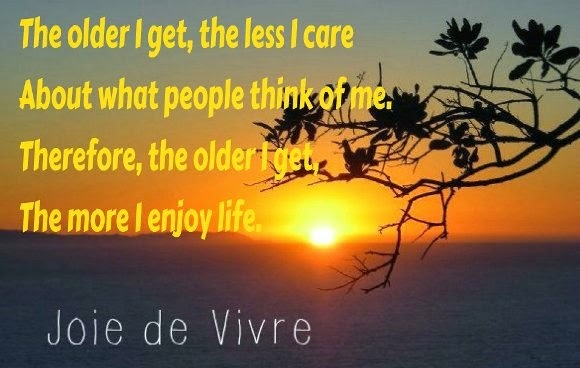 Growing older has its many challenges, but why dwell on them and feel depressed when we have a choice to look at the bright side and count our blessings? In the final analysis, it's more important what we think of ourselves than what others think of us. Live life to the full, and be thankful for each new day. SENIORSALOUD is pleased to announce that we are supporting UMMC's MELoR project to study the needs and challenges of the ageing population in Malaysia. MELoR is an ambitious research-based project that seeks to collect and collate data from 3000 respondents in selected areas in the Klang Valley. It will present the findings to the government. Let's hope they will adopt the findings and implement changes that will bring about a better quality of life for the senior citizens in Malaysia. 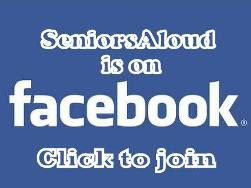 SeniorsAloud has always held the view that all ministries must work together to ensure a better future for our elders. Our needs extend beyond having access to adequate and affordable health care. They cover a wide spectrum of areas including age-friendly housing, public transport, elder rights, re-employment opportunities and financial support. We encourage our members and other warga emas residing in Lembah Pantai, Petaling Jaya Utara or Petaling Jaya Selatan to participate in the survey. It is time our views be heard, and this is an effective and credible way to get the policy-makers to listen to us. After all, our numbers are increasing, and our voices can only grow louder. The MELoR team headed by Associate Prof Dr Sharul Kamaruzzaman will be meeting with SeniorsAloud members in the first week of April to explain the project and to interview them. When we take care of the bookend generations - the children and the elders, everyone benefits. Here is a write-up about MELoR in The Star dated 22 Nov 2013. RESEARCH studies are vital to recognise concerns as well as access thoughts, opinions and feelings on issues ranging from culture to politics. Besides providing new insights on various topics, research plays an important role in making decisions for better living, too. As our country moves towards an ageing society, it is important to take the necessary steps to meet the needs of a growing elderly population. As such, Universiti Malaya’s effort to conduct the Malaysian Elders Longitudinal Research (MELoR) comes at a timely juncture. MELoR principal investigator Associate Professor Dr Shahrul Bahyah Kamaruzzaman explained that the country is facing a “silver tsunami” as Malaysia’s ageing population is rapidly growing. She explained that action-orientated research is vital in facilitating our nation to prepare for the challenges facing senior citizens. “The demographic transition from a young to older age structure has reached global proportions among the world’s population. Western countries became aged when they were already developed, but Malaysia – being a developing country – has a shorter time to adjust to this rapidly ageing population. This has significant implications for the country’s economy and the distribution of care services across all ages,” said Dr Shahrul. The world’s population is undergoing an “ageing boom” as there is a rapid increase in the number of older people today. The Malaysian National Statistics Department Population Projection (2010-2040) states that the population aged 65 and above is estimated to increase three-fold by 2021. In 2010, there were two million people over 60 years (7%); this number will reach 3.4 million (11%) by 2020 and is expected to touch nine million (22%) by 2050. Compared to Western countries, the Malaysian elderly population is increasing even more rapidly. MELoR aims to generate comprehensive data on the overall needs and issues faced by the older population in Malaysia. The study is unique in that the information is derived through interviews and health checks, covering all aspects of health, quality of life, housing, social needs, and economic and financial requirements. Dr Shahrul explained that the research study would provide a solid foundation for a more strategic policy-making and legislative framework for the care of the elderly. “Some of the common issues faced by seniors include lack of access to basic transportation, lack of age-friendly infrastructure and services within their community, rising cost of living including in assisted nursing homes, and clear paths in accessing medical care and services,” said Dr Shahrul, who is a consultant geriatrician at University of Malaya Medical Centre (UMMC) in Kuala Lumpur. Elderly care is a national challenge as there are only 19 qualified geriatricians to cater to the 7% elderly population out of the country’s 28 million citizens. The majority of the specialists are in Kuala Lumpur (nine), Perak (three) and Johor (two), with one geriatrician each in Malacca, Penang, Selangor, Sabah and Sarawak. Presently there are only 13 medical personnel who are training to be geriatricians. “Our main aim is to assess and investigate the needs, issues and challenges of our growing older population. MELoR’s vision is to ensure a better standard of living for Malaysians as they grow older,” she explained. Dr Shahrul added that a lot of the information that formed the basis for MELoR came from a focus group discussion and meetings with senior citizens’ organisations, residents’ associations, nursing home administrators and various NGOs in Malaysia. The research is supported by the Education Ministry with a research grant of RM4.57mil for three years. 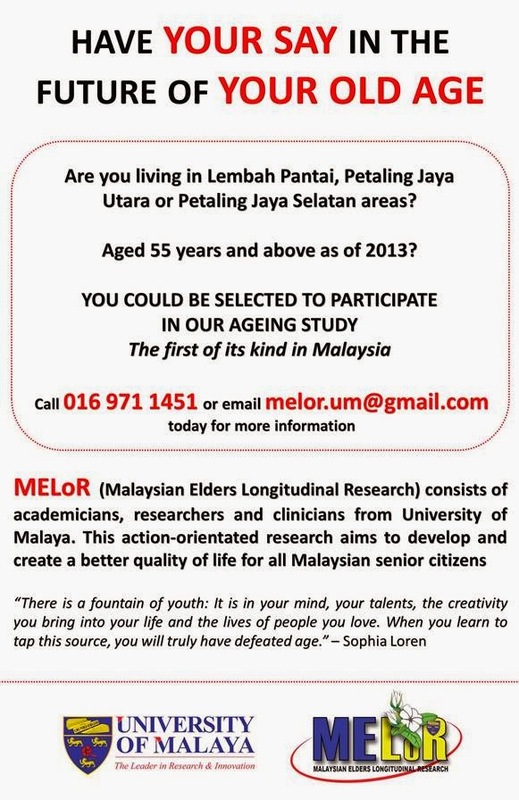 MELoR is looking for senior citizens who would like to participate in the research project. The initial assessments will be conducted on three separate occasions. The first two visits will be home-based. The final visit will be at the study centre. Two research assistants will be assigned to the same participant throughout the study period. 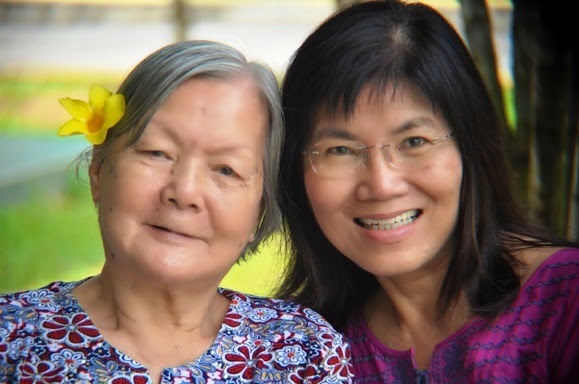 Retired nurse Yoong Ee Fah, 70, applauds UMMC’s efforts to conduct MELoR, as the study could create a comprehensive framework to improve policies and legislations for the elderly. “This is the first step towards generating comprehensive data on the needs and issues faced by the elderly. The study will be useful in improving the needs of the elderly, especially in the areas of transportation, medical care and legal protection,” said Yoong. For more information, contact MELoR Room at 016-9711451 or email us at melor.um@gmail.com. Since the very first article 'For retirees, every ringgit counts' was posted here in May 2008, SeniorsAloud has posted close to 850 articles including videos on the blog. I did a quick check on the number of page views per post, and this is what I have discovered. While the articles cover a wide range of topics, the ones that have garnered the most page views are on health, finance and nursing homes. The top 10 most popular posts are listed below with the accompanying links. Click on the titles that interest you if you wish to read the content. My personal favourite is Tan Sri Dato Dr Ani Arope's retirement speech entitled 'A Peacock today, A Feather Duster Tomorrow'. It is one of the best retirement speeches I have come across, with plenty of practical and sensible advice for soon-to-be retirees. I certainly wish I had known about it earlier, and made better preparation for my own retirement. This article "A sweetener for the Pioneer Generation" appeared in The Star today (1 March). The writer, Seah Chiang Nee, has brought up several pertinent points that provide food for further thought. However, I shall highlight only those that non-Singaporeans might find hard to believe - that in one of the world's wealthiest nations, poverty still exists. And it's the elderly that make up a high proportion of the poor and the needy. those aged 65 and above total some 450,000 or 9.9% of the population. One out of three hospital patients are above 65 years old. A total of 54 kidney patients in two hospitals chose death over dialysis because they could not afford the long-term process of dialysis. The elderly form 9.9% of the population but account for 23% of all the suicides in the country. Health problems and depression were the main reasons. Visitors who come to Singapore for shopping and sightseeing leave with a very positive impression of the republic. It's easy to see why. In just 49 short years since becoming a fully independent nation, Singapore has chalked up an enviable record of achievements. It boasts world-class infrastructure and facilities, high educational standards, and is listed among the world's top go-to destinations for medical treatment and healthcare. The irony is that Singaporeans are finding their country an increasingly expensive place to live in. It is a daily struggle living from hand to mouth, especially for the elderly. They are the ones in need of medical treatment and healthcare, yet they can ill afford (pun intended) such services. "The worst sufferers," writes Seah, "are those with chronic illnesses and insufficient funds for treatment." Hence, the oft-heard complaint among senior citizens - 'You can die, but you cannot fall ill in Singapore'. I am a regular visitor to Singapore, and have been so since the 1960s. I have family there. Many of my former classmates and students have also settled there. Over the years I have watched how Singapore has rapidly overtaken Malaysia, leaving the latter trailing far behind in virtually every field. Today, Singapore is no longer just a tiny red dot at the southern tip of the Malayan peninsula. It is a success story that other countries aspire to emulate. But there is another face of Singapore that is hidden or rather, yet to be discovered by affluent visitors and tourists who equate Singapore with Orchard Road, Marina Bay Sands and Clarke Quay. Take a train or bus ride into the heartlands. It's a whole different Singapore that meets your eyes. But one doesn't have to go to the heartlands to see how the common people, especially the elderly, are living. Pay a visit to the older parts of the city like Chinatown and Albert Street. You will see elderly women rummaging through garbage bins to find something they can use or sell. They are the rag and bone, bag ladies of Singapore. Pop into a food court in any of the swanky malls along Orchard Road, and you will notice that the majority of the serving staff and cleaners are senior citizens who are way past their working life. Ask them why they are still working, and you will get the answer "If I don't work, how will I eat?" 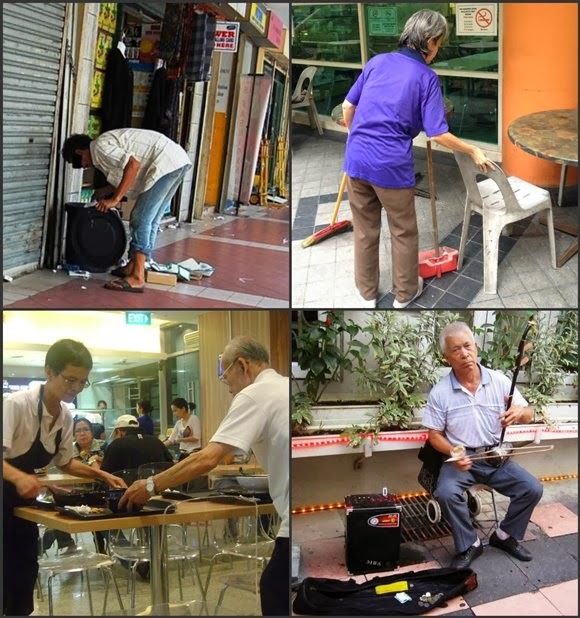 Taxi-drivers, street buskers, vendors at hawker centres - they are among the growing number of older people who have little choice but to continue working for as long as they are physically able to do so, and as long as they can find a company that will employ them. They are the pioneer generation who have given the prime years of their lives to help transform the country into a global giant in wealth and technology. Now in their 60s and 70s, these senior citizens need support from the country. It is payback time. 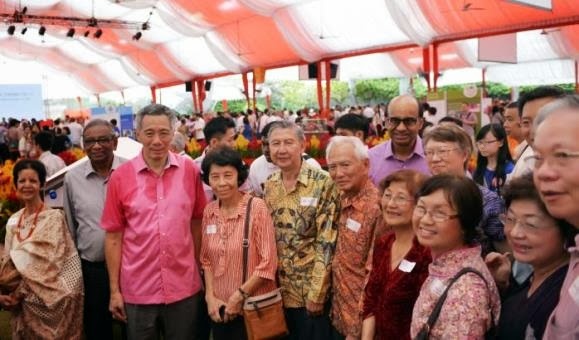 The government has listened and is responding positively with the recent announcement of the Pioneer Generation Package - a S$8bil (RM20.7bil) plan that will help defray some of the healthcare costs of elderly Singaporeans aged 65 and above. Any financial assistance from the government goes a long way not only in providing affordable healthcare for the elderly, but also in helping their adult children for they are the ones footing the bill for their parents' medical expenses. Some will say this smacks of vote-buying by a government that is seeing its popularity ebbing away. Others will say it's too little too late. 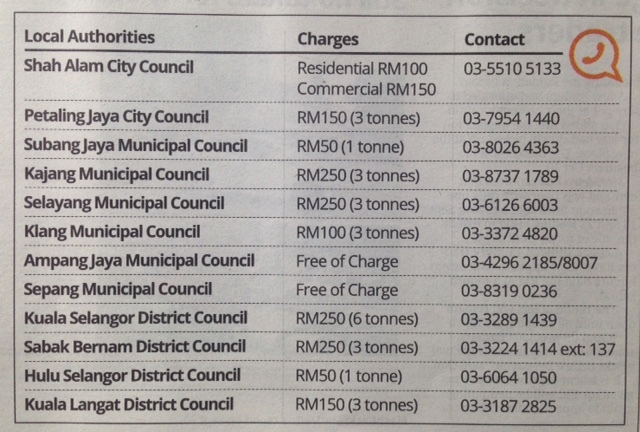 Well, older Singaporeans can't be bought that easily, and better late than never. 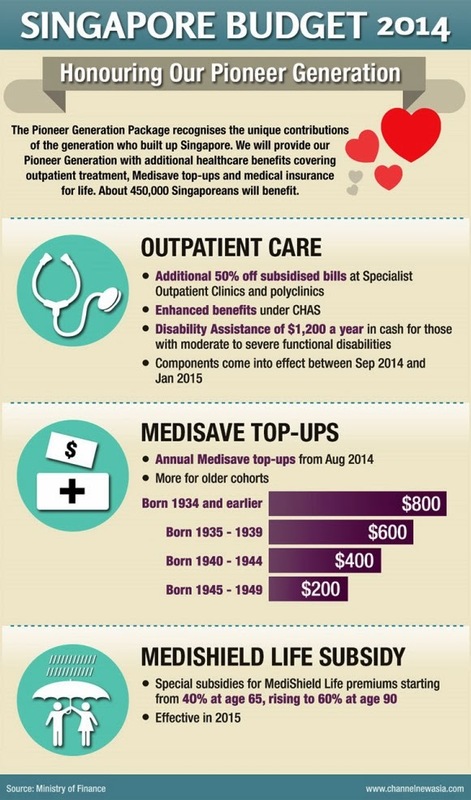 Speaking as a non-Singaporean, all I can say is I am glad for my older relatives and friends in Singapore who will be receiving an annual subsidy of S$200 to S$800 (RM517 to RM2070) to help towards paying the premiums of the new health insurance scheme to be introduced soon. They will also receive an additional 50% discount at out-patient specialist clinics in hospitals and polyclinics.